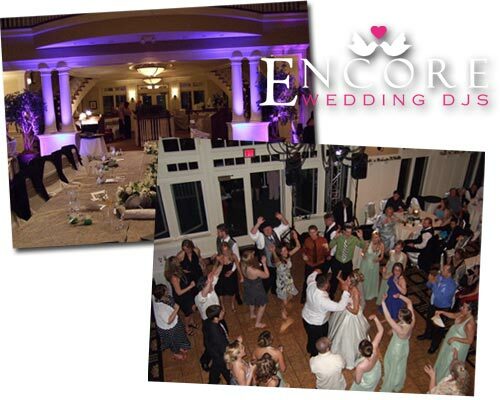 Okay, so we provided the wedding DJ entertainment at Stephanie and Eric’s wedding reception in Clarkston Michigan held at Oakhurst Golf and Country Club. Art had a surprise for his daughter by playing a sideshow right before the daddy daughter dance which was a nice touch. And her Uncle flew from the other side of the country just to bring a explosive tank to the reception. The story is that he had it since she was 8 and promised to blow it up at her wedding. Something else to note, was that they needed remote sound for the second room so we had to bring out a couple more speakers. In addition they got some accent lighting which was a great touch to the wedding. We had their pillars accented in the color sage during the most part of the reception (in the pic above they are fading between deep pink and purple). On a final note if you are planning a wedding reception and need a wedding DJ in Clarkston Michigan, then contact us today and let us prove to you why we are your best choice for entertainment and lighting!